Upon his arrival, rather than changing into a sweater, Mister Rogers puts on a protective artist's jacket. Taking some clay into the kitchen, he makes a brontosaurus while talking about expressing feelings through artwork. After singing What Do You Do, Mister Rogers talks about how dreams are sort of like pretend -- they are "thoughts that when you wake up, you see that they're not real." In the Neighborhood of Make-Believe, Daniel talks to Lady Aberlin about having seen the dinosaur near the Museum Go-Round. Moments later, Lady Aberlin and Handyman Negri encounter the dinosaur for themselves but, using her boomerang, Lade Elaine Fairchilde sends the dinosaur away. Back at the house, Mister Rogers changes into his sweater and attempts to call Mr. McFeely but dials the wrong number by accident. Very cordial on the phone, Mister Rogers teaches viewers a subtle lesson about making mistakes. Hello? Hello, is this the McFeely residence? Oh, I'm sorry. I must have the wrong number. Yes, I know. That does happen sometimes. Thank you very much. Bye bye. Mister Rogers meets Mr. McFeely at the television studio where they meet Bill Bixby, star of the television program The Incredible Hulk. Mr. Bixby shows them the set and explains that what takes place in a television studio is just pretend -- it is his type of make-believe. Mr. Bixby goes on to show a few clips from the show and to talk about how he liked to pretend when he was a child. He also mentions that he would get angry from time to time when he was younger: "It's okay to be angry and it's alright to let it out as long as we don't hurt anybody else and as long as we don't hurt ourselves" Before leaving, Mister Rogers and Mr. McFeely get to watch as a scene from The Incredible Hulk is filmed. The scene features co-star Lou Ferrigno in full character as the Hulk. They set up another visit for the following day to see Mr. Ferrigno without his make-up. Returning to the house, Mister Rogers shows a few pictures of other popular superheroes and talks about how everyone is special, with or without super powers: "You yourself don't have to be any kind of super strong. Or super smart. Or super anything. No. Just the way you are." This leads into It's You I Like. After changing into his coat, Mister Rogers takes viewers outside his television house to show another section of the Neighborhood set. Giving viewers a glimpse of the model set used in the opening and closing of each program, he comments that "it's such a good feeling to be truthful with people." Standing beside the model Neighborhood, Mister Rogers wraps up for the day with It's Such a Good Feeling. Bill Bixby's comments about anger are especially relevant considering his role on the Incredible Hulk. His character is often remebered for the line "You wouldn't like me when I'm angry." The episode of The Incredible Hulk episode being shot in the segment with Lou Ferigno is titled "Homecoming." This is the eighth episode from the program's third season which originally aired on November 30, 1979. The Neighborhood of Make-Believe segment in this episode is shorter than usual -- only taking up about 4 mintues of the program. The Neighborhood of Make-Believe storyline is used (with a few changes) as the basis of the book When Monsters Seem Real. Segments from this week's episodes are featured on the VHS release Dinosarus and Monsters. What Do You Do With the Mad That You Feel? The Incredible Hulk television series is the property of Universal City Studios, Inc. Copyright © 1979. All rights reserved. The Incredible Hulk and Spiderman characters are the property of Marvel Comics Group, a division of Cadence Industries Corp. Copyright © 1979. All rights reserved. The Superman and Wonder Woman characters are the property of DC Comics, Inc. Copyright © 1979. Used with permission. © 1979 Family Communications, Inc. This site is best viewed using the most current version of Google Chrome. Content copyright © The Fred Rogers Company. Used with permission. Corner image by Spencer Fruhling. Used with permission. 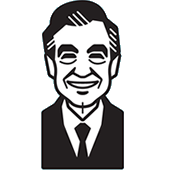 Do not duplicate or distribute any material from this site without the consent of The Fred Rogers Company.